From time to time I think everyone goes through a period of self-reflection. Recently, I had a milestone birthday and it made me think about my past and where I’m headed in the future. Like everyone else, I’ve made some mistakes in the preceding years, but I’ve made a lot of good decisions too. Something else I’ve discovered is that anytime I work on self-improvement I’ve never regretted it. I would say I am continually investing in myself and my future. In fact, I believe there are at least 7 different ways to invest in yourself. Nobody likes to think about all of the bad things that could happen to you throughout your lifetime. However, the reality is that things sometimes don’t go as you plan. That’s one of the reasons you should have insurance. There are many different kinds of insurance from homeowner’s insurance to pet insurance and many others in between. Obviously, having insurance can’t prevent all of the undesirable events from happening. But investing in it can give you peace of mind and protection from financial ruin. Another one of the different ways to invest in yourself is to start a side hustle. I started my own side hustle about a year and a half ago. It has now grown to the point that I will soon be turning it into my full time career and leaving my regular job. Understandably, not everyone would want to follow my example. Self-employment isn’t everyone’s cup of tea. If you need a creative outlet or a little extra income, though, a side hustle is a great way to get both. Additionally, you may learn some new skills you can apply elsewhere in your future. 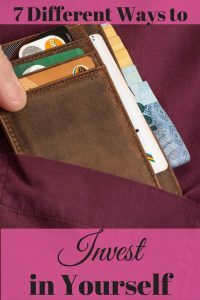 Reading books, blogs, magazines, and other material may not seem like an investment to some people. I disagree, however. For example, my change in career paths is leading me to use many of the different things I have read about in the past. I am also using pieces of just about every job I have ever had. You never know when something you read will help you in the future. That’s why reading about a variety of topics and experiences is never a waste of time. One of the other ways to invest in yourself is to go back to school. Although I’ve not chosen to go down this path, many do and have found it to be a good investment. Going back to college will require a monetary investment. Nevertheless, the end result could be a much higher salary and a larger nest egg come retirement time. Choosing to simply invest is another of the ways to invest in yourself that you could choose. No matter what your income or level of expertise there are many different ways to do it. Rental properties, 401K plans, Roth IRA’s, and stock are just a few things you could invest in. There are many others and lots of information on the internet to help you start. The sooner you invest for your future goals, including retirement, the more likely you are to reach them. Something I have always wanted to do is learn a new language. So far, the furthest I have gotten is to learn a dozen or so Spanish words, but not enough to converse fluently. My reasons for wanting to learn Spanish are two-fold. For one, I want to help the patients that I interact with on a daily basis. The other reason is merely because I think the language is beautiful. No matter my reasons, I have always felt that learning a new language is an investment in yourself. That is especially true if you will be in an environment to use it often. None of the other ways to invest in yourself can be accomplished if you do not take good care of yourself. I am a bit of a hypocrite when it comes to this at the moment, I will admit. But I expect to fix that in the near future, however. Nobody can sacrifice taking care of themselves for the long term. You must eat the right kinds of foods if you expect to get good results. Garbage in equals garbage out, as they say. Invest in yourself by eating right, sleeping enough, drinking plenty of water, and exercising. Personally, I can’t wait to get back on track with these things and take better care of myself. My future kind of depends on it. Every day is a new chance to try to improve myself and become the best “me” I can be. I hope you use these 7 different ways to invest in yourself to be the best “you” you can be too. What are some of the different ways you invest in yourself? Taking care of yourself is sooo important! Many often forget about this “little” aspect because we’re all so busy doing a million things at the same time. We live in busy times, but we definitely shouldn’t forget about our own well being.